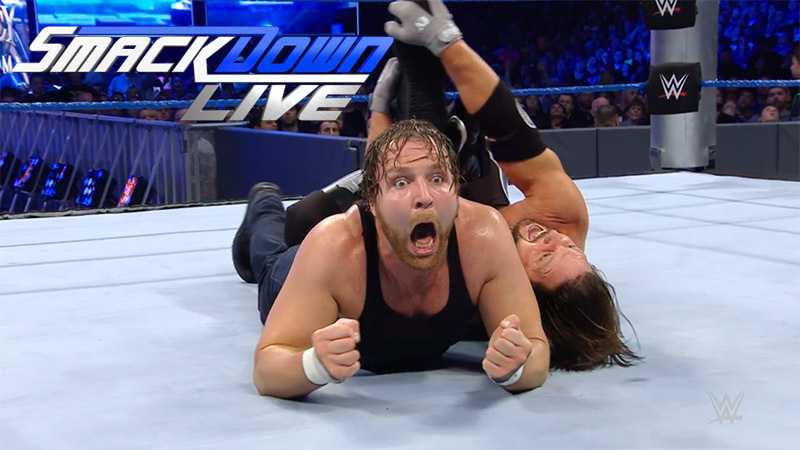 Tonight, AJ Styles defends his title against Dean Ambrose. Randy Orton heads to the ring. He knows why Bray Wyatt likes to talk about fear; it’s because he’s afraid. He’s afraid of Orton. He’s had enough of the mind games though, and he calls Wyatt to the ring to face his fears. Bray Wyatt appears on the tron and recounts the story of Hansel and Gretel. He also tells Orton that he is in control and Orton is in no place to make demands. Bray then starts to sing before the tron goes dark. Orton leaves the ring. Charly Caruso asks Dead Ambrose what’s going through his mind before his match. He says he will break AJ’s face and take back the title AJ stole from him. This match was a lot of fun, did a really great job of furthering feuds, and built interest in the PPV very well. The match was mostly American Alpha (mostly Gable) versus The Usos, which makes total sense given Gable’s injury and anger. The Usos used Gable’s anger to their advantage and isolated him well with the help of The Ascension. Eventually, with ringside shenanigans, Heath Slater ended up getting the hot tag from Gable before the match started to break down leading up to the finish. It was fun seeing Slater get the hot tag, and even though most of the match seemed to focus on The Usos versus American Alpha, the finish put the focus squarely on the title match at No Mercy between Slater & Rhyno and The Usos. Charly Caruso asks John Cena if he cares who wins the title. He doesn’t. The Miz (with Maryse) has someone put his picture over a picture of Lebron James in a hallway of the arena. Randy Orton finds an arrow made out of tree limbs hanging on a wall in a darkly lit room in the arena. He turns the arrow around and walks in the opposite direction of where it was pointed, but after the camera moves away and then back, the arrow turns back the other way and points to Erick Rowan. Bray Wyatt admonishes for not following directions. In a taped promo, Natalya and Carmella run down their opponents for tonight. Naomi and Nikki do the same. Okay match. There wasn’t really a lot to it other than being a way to maintain interest in Carmella versus Nikki. The Miz and Maryse make their way to the ring. Maryse introduces a video chronicling the history of The Miz (though it’s pretty heavy on recent happenings). Back in the ring, The Miz is upset that he hasn’t been given a better reception in his hometown. He then introduces his parents and points out that Ziggler’s parents are also in the front row. That prompts Ziggler to head to the ring. Ziggler tells Miz not to talk to his parents. He then congratulates Miz on his tainted title and starts to leave. Miz points out that the record books will just show that he’s champ, and that he’s been champ over and over. He says Ziggler should be embarrassed about his career. He tells Ziggler that he has nothing and leaves Ziggler alone in the ring. When the Miz is half way up the ramp, Ziggler stops him. He says that sometimes the things you love don’t love you back. But Ziggler can’t stop. It’s a sickness. He tells Miz that if he gives him one more title shot, he’ll put his own career on the line. Miz agrees. Bray Wyatt feels like he’s playing with a mouse. He also thinks it’s funny. Becky Lynch comes out (presumably for a match), but Alexa Bliss attacks her from behind while she’s still on the stage. After leaving her face down on the stage, Alexa says Becky doesn’t deserve the title. Gravity has to obey the law of Curt Hawkins. Doctors recommend that each night sleep gets at least eight hours of Curt Hawkins. The earth is 70% water and 30% Curt Hawkins. Bray Wyatt was wrong about Randy Orton. The Viper has no venom. As Bray wonders where Orton is, Orton shows up behind him in a sheep mask. Orton punches Bray until he goes away. Orton then puts the sheep mask back on and sings and laughs. Charly Caruso asks AJ Styles about what Ambrose and Cena said earlier. Styles says he’ll beat Ambrose again. That’s all that really matters. Remembering Ritchie Valens for Hispanic Heritage month. Good match. It wasn’t quite PPV quality, but it was very good. The ending was clever and did a good job of building interest for No Mercy. I think part of the reason this didn’t feel as big as it might have is because with a triple threat coming up, it really made no difference who the champ going in would be. There was no real reason to switch champs right here. The show had two good matches that are definitely worth watching, and the segment with The Miz and Dolph Ziggler was very good, but overall it felt like there was too much time spent on stuff that either wasn’t that great or was just average. I especially didn’t care for any of the Orton/Wyatt stuff. I really liked the tag match too, but this was a better wrestling match.